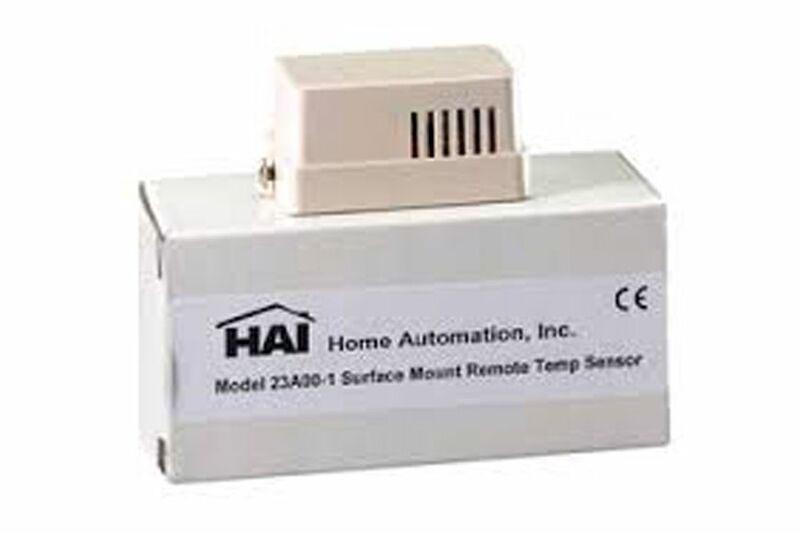 The Surface Mount Remote Indoor/Outdoor Temperature Sensor may be mounted in the conditioned space and the thermostat can be mounted remotely for protection from tampering or for aesthetic reasons. This sensor may be used by Omnistat2 thermostats as an outdoor sensor for dual fuel heat pumps. This sensor uses twisted pair, shielded cable from the Omnistat2 or Omnistat thermostat to its location. For distances up to 100 feet, typical twisted pair, PVC-insulated, shielded cable may be used. For distances from 100-150 feet, twisted pair with polypropylene insulated conductors, shielded must be used. For distances from 150-250 feet, twisted pair with foam-polyethylene insulated conductors, shielded must be used. Wire runs must not exceed 250 feet. The Remote Sensor must be mounted in the same location appropriate for a thermostat for best performance (for example, on an inside wall, free of draft from vents, away from sunlight, windows, etc.). This small (2 W X 1.5 H X I D inches) unit is mounted on the surface of the wall. This sensor will work with any Omnistat2 or Omnistat thermostat.